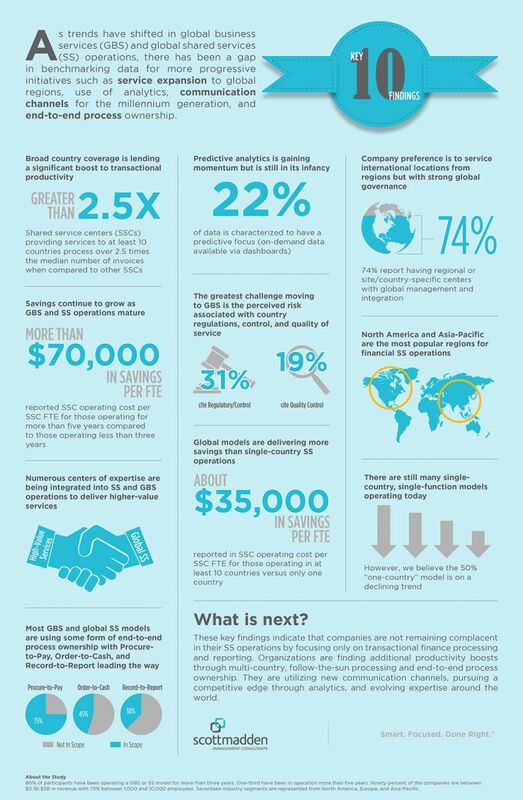 As trends have shifted in global business services (GBS) and global shared services (SS) operations, there has been a gap in benchmarking data for more progressive initiatives such as service expansion to global regions, use of analytics, communication channels for the millennium generation, and end-to-end process ownership. In order to gather this type of information, ScottMadden joined forces with the American Productivity & Quality Center (APQC) to conduct a global benchmarking study of Finance SSOs that provides organizations with benchmark comparisons based on leading trends, maturity, and globalization. The following summarizes the insights and key findings from the results of the survey. For more information about progressive GBS and global SS trends, please click here.